If you’re looking for a top-of-the-line give-away for the discriminating client, then you’ve come to the right place. Featuring a black, hand-stitched, 100% leather exterior, our Custom Dice Cups are the finest available anywhere. 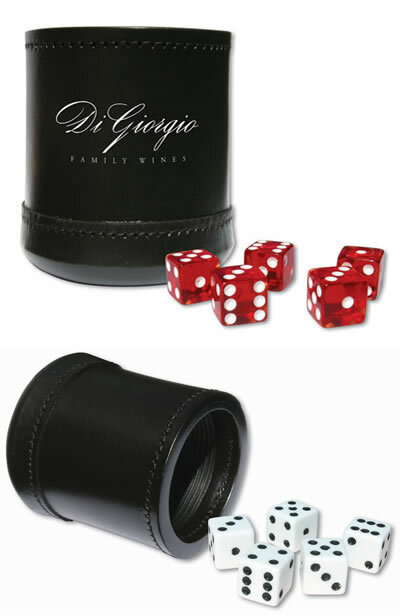 Each premium Custom Leather Dice Cup features a black ribbed interior and comes standard with your choice of five white 3/4" dice or five transparent red casino-style 3/4" dice. Other Dice colors such as black, blue, green, orange, pink, purple, and yellow are also available at no additional charge! Our Real Leather Custom Imprinted Dice Cups measure 3-3/4" tall by 3-5/16" in diameter. Your design/logo is imprinted on one side of each Dice Cup.